Sometimes things just work out the way they're supposed to. I went to Hammonasset State Park in Madison, CT in hopes of intercepting the flock of 8 American White Pelicans that was seen yesterday in Providence, Rhode Island. As a birder all you can really do is put yourself in the best position and hope that you get lucky, but it usually doesn't work out. I arrived at Hammo for opening at 8am and decided I would bird within sight of the beach in case the pelicans did fly by, figuring that being right on the coast would put me in the best position. Not much was moving early this morning on the heels of yesterday's storm...just some blackbirds, Horned Larks, a Pipit, a few Goldfinches and that's about it. As the morning went on things remained quiet, although a modest gull migration was underway in the form of small flocks moving east to west along the coast. A look off Meigs Point revealed 2 Surf Scoter, 81 Dunlin, 1 Sanderling, and 5 Ruddy Turnstones. At this point the cold wind was getting to me, so I decided to watch from the warmth of my car while parked at the Nature Center lot. A flock of Horned Larks in the lot didn't contain anything different until an unlikely mixed flock of 6 Cowbirds and 3 Snow Buntings arrived. Sometime before 1 o'clock I was getting bored and losing hope on the pelicans. I drove to the campground and birded the general area where Mark Szantyr and I had the hybrid Baltimore x Bullock's Oriole the week before. There were a few pockets of birds including a Purple Finch, robins, waxwings, and a bunch of Yellow-rumps, but no sign of any orioles. After poking around some cedars in a half-assed attempt at owling, I stepped back onto the path, glanced up...and...$#&%! There they were. Eight of them. Got my looks, made a quick call to Mark Szantyr who was also in the park, then fumbled with the camera to grab some record shots. Lucky enough the birds broke into a soar somewhere over the west end of the park, allowing for even better looks and a couple more photos. They continued to mosey westward until out of sight. I first spotted them at 1:26 and had them in view until 1:35. Posted to CTBirds, made a few phone calls to folks to the west, and met up with Mark and Joy as we talked about how cool it was to track birds from ME to RI and then see them in CT. On my way home Julian Hough called at 2:21 to let me know he was standing on the West Haven side of New Haven Harbor waiting for the pelicans to appear. At the pace they moved over Hammo, being in view for 9 minutes, I thought I might have out-driven them...so I decided to go the extra couple exits on I-95 and stand watch with Julian. I don't think I was there for more than a minute when Julian spotted the flock as it came off Lighthouse Pt at 2:36 and headed over the harbor. The flock then dropped low and continued across the harbor, crossing well offshore and not again making landfall until well down the West Haven coast. The flock then broke into a couple brief soars while slowly continuing to the west. I called Scott and Frank with the update. Incredibly the flock was in view until 2:58 when they disappeared into the haze, making for a 22-min observation. The crew in Stratford was ready and waiting. Scott first spotted the birds at 3:10 while standing at Stratford Pt. For the story from here, check out Scott's post. So, it took the pelicans an hour to get from Hammo to West Haven (18 miles), for a speed of about 18 miles per hour (that's my kind of math!). Then another 40 minutes for the 12 miles from NH harbor to Short Beach, which clocks them at...you guessed it, 18 miles per hour! Another pretty cool tidbit is the fact that Scott was about 12 miles from me and Julian, and there was only a 12-minute gap between us losing sight and Scott's first glimpse. 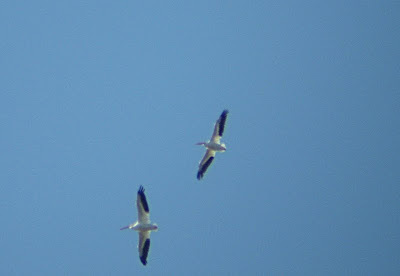 Goes to show you can see a flock of 8 American White Pelicans from quite a distance! A little more math here. For those looking tomorrow morning, you're probably wondering where the flock might have landed for the night (assuming they did land). If we were to guess that they stopped flying at 10 mins before sunset, which would be 4:15pm, that would give them about 18 more miles of traveling. This would put them in the vicinity of the Norwalk Islands for touchdown, after crossing Sherwood Island at approximately 3:55. However, Tina Green rushed from Stratford to Westport so she could view them from Sherwood Island, but she didn't have any luck. So I wonder if they landed before they reached Sherwood. So are there any birds left I can give you a hard time about? I can't think of anything I have in CT that you don't. Nick, you are THE MAN!!! You must have some real connections somewhere. If YOU think it then it wil come to pass. Congratulations on being spot on with your prediction, and also being the one to find them. Strong work! Thanks Chris. It's great when things work out like that. They most have flown right by my house as I live in Phippsburg, Me, but sadly, I missed them! Great photos. I especially like the last one that's sort of sepia toned over trees. Nice blog you've got here, too.